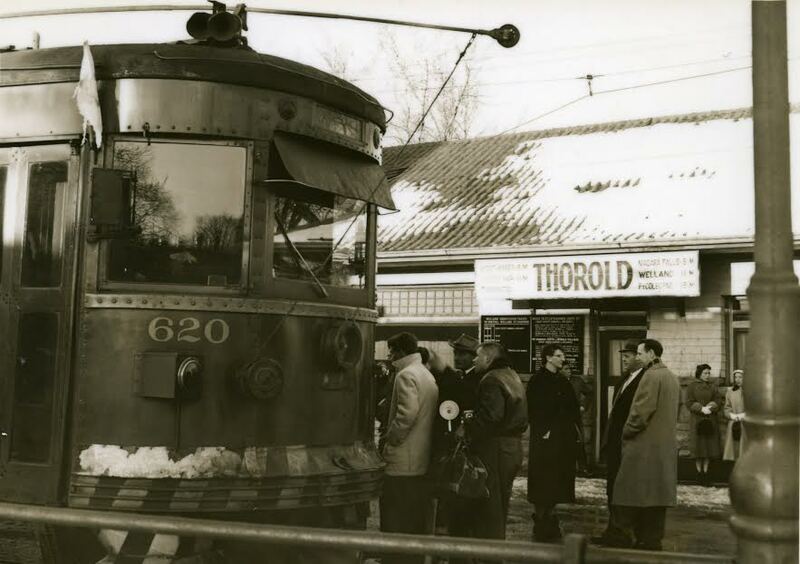 A story appeared here earlier in the month about the last trip of the N. S. and T. (Niagara, St. Catharines and Toronto Railway) trolley, back on Saturday, March 28, 1959. It was a first-person account by Bob Chambers, a renowned Tribune photographer, who was aboard with two other Tribune staffers for the Thorold-to-Welland leg of the historic trolley ride. The two others were Managing Editor T. N. Morrison and reporter Ken Martin. In its Monday, March 30, 1959 edition, the newspaper ran five photos by Chambers including one on Page 1, reporting by Martin and an editorial by the managing editor. Aboard one of the two cars was Welland’s Centennial Queen, Laurie Muise, who was returning home for the weekend, which happened to be Easter weekend. One of the photos by Chambers shows Miss Muise and N.S.&T. motorman Russ Cudney. She passed March 30, 2015, at 76. This was reported in the first piece, headlined Last Ride With A Queen. What’s interesting for the purpose of this follow-up story is the newspaper’s editorial and the scolding given Welland, which went unrepresented at the historic occasion even though the city had been invited to send representatives. Mr. Morrison was clearly taken aback by the city’s rebuff and didn’t mince words when it came to giving it a dressing down. I’m providing the editorial in its entirety for your reading enjoyment. I also asked photographer Chambers if he would be interested in providing a picture from that “last ride” as we have come to call it. He responded by sending two. 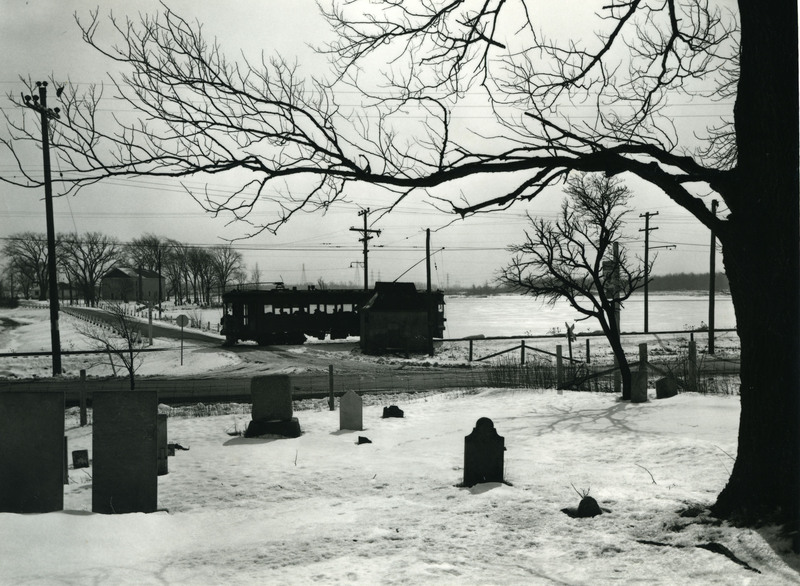 One is the photo that ran in the newspaper just prior to the day of the event; the other shows a trolley car stopped at a station waiting for passengers to get on board. Both are eye catching and delightful, so characteristic of the photographer’s work during his 13 years at the newspaper. The captions were written by photographer Chambers. For more than 40 years, the N.S. and T. electric cars rattled over the route between Thorold and Port Colborne. Before the automobile became so commonplace, it was the main transportation link between the communities along the route. Welland and Crowland industries depended on it to get many of their employees to work. It carried heavy quotas of shoppers into Welland from the outlying points. On Saturday night, the last run over the line was made by the electric car. It was a sentimental occasion and all of the communities on the line were asked to send official representatives to be in on the wind-up. St. Catharines, Grantham, Port Dalhousie, Merritton, Thorold, Fonthill, Thorold Township, Crowland, Humberstone Township and Port Colborne all had at least two representatives on the run from St. Catharines to Port Colborne. The N. S. and T. had most of their officials on hand. The Canadian National Railways provided several of the top executives of the Central region. Port Colborne and Thorold were joint hosts at a delightful reception and buffet for the party at the Port Colborne Club. The municipal representatives present showed regard for the historic occasion. The city of Welland, which, as most everyone knows, seeks to absorb slices of neighbouring communities in the friendliest fashion, had been invited to have three representatives on the trip. One of the main topics at the reception was the cold shoulder given the affair by Welland. Not one of the nine elected council representatives in Welland put in an appearance. Not even a delegated city official. This entry was posted in Uncategorized on April 30, 2015 by fromareportersnotebook. Welland Public Library is remembering Lois Lilienstein, who passed away in her Toronto home April 22, aged 78. She was part of Sharon, Lois & Bram, who entertained a generation of Canadian children, and also had a top-rated preschool show, Sharon, Lois & Bram’s Elephant Show. It aired on TVO and CBC in Canada. The library has a collection of sound recordings by the famous trio. Drop in and see what is available. 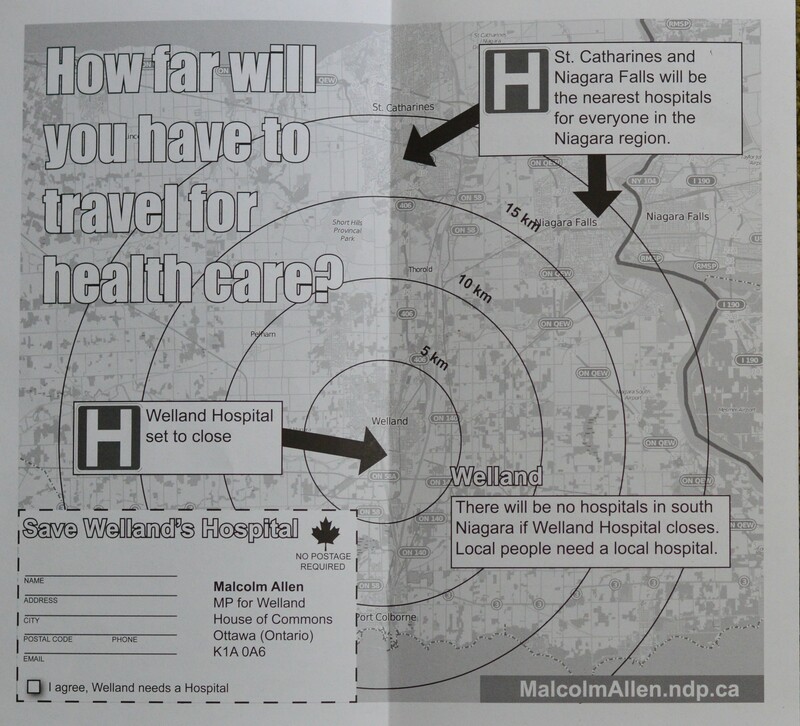 MP Malcolm Allen has sent out a newsletter to constituents about the Welland hospital and the possibility of it closing. The newsletter has an easy clip return card which constituents opposed to the closing can sign and mail to the MP. Welland Public Library is offering a series of National Film Board of Canada documentaries. The first screening is May 7, from 7 p.m. to 8:30 p.m., titled Fort McMoney, a post on the webpage says. When the Fort McMoney documentary game went online, it received both critical and public acclaim. The film version returns to Fort McMurray, Alberta, the world’s third largest oil reserve, to answer the question: Is democracy oil-soluble? We meet Jim Rogers, a trapper and Fort McMurray native, who ran unsuccessfully in the most recent municipal election and has seen his tiny town experience a modern-day version of the gold rush. Next up, on May 14 is Nothing Sacred. This feature documentary is a portrait of Montreal political cartoonists Aislin and Serge Chapleau. In the pages of The Montreal Gazette and La Presse, respectively, they’ve been skewering politicians for 30 years. But who are these biting satirists? The film seeks to answer this question through interviews with the cartoonist’s friends, families, colleagues, and even a few of their favourite victims, including Gilles Duceppe and Louise Beaudoin. Featuring many of their classic cartoons, Nothing Sacred pays tribute to gifted iconoclasts whose hilarious characters have seeped into our collective consciousness. Everyone is welcome. No registration is required. Check the library’s website for other docs in the series. Opera and musical theatre duets will be featured in a benefit concert at Welland’s Central United Church. The May 3 concert is a fundraiser for the Harvest Kitchen program at Central. It starts at 1 p.m. $20 is the suggested donation to attend. “I asked Chris what needs attention at the church, what needs some focus and that’s what he suggested,” said Jen Carter, one of the performers and wife of Central United pastor Chris Fickling. 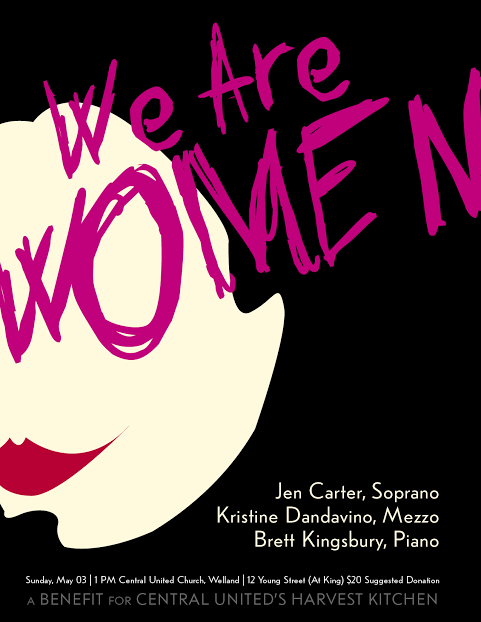 Carter, a soprano, will perform with mezzo soprano Kristine Dandavino and pianist Brett Kingsbury. The name We Are Women is taken from one of the duets in Leonard Bernstein’s operetta, Candide. It is one of the pieces that will be performed during the benefit. Carter said she is a volunteer server with the church’s Harvest Kitchen outreach. “It’s moved me to know that the need is right here under our nose and there are many people who rely on Harvest Kitchen,” she said. Significant Moments in Ontario Sporting History, a travelling exhibit from the Archives of Ontario runs from May 1 to June 30; Pan Am Games Exhibit runs from May 1 to December 31; 50th Anniversary of the Welland Regina Lodge. Wine and cheese will be served at the opening reception, which takes place May 7, from 6:30 p.m. to 8:30 p.m.
Green thumbs take note: Welland Horticultural Society has announced the date of one of its most popular events. 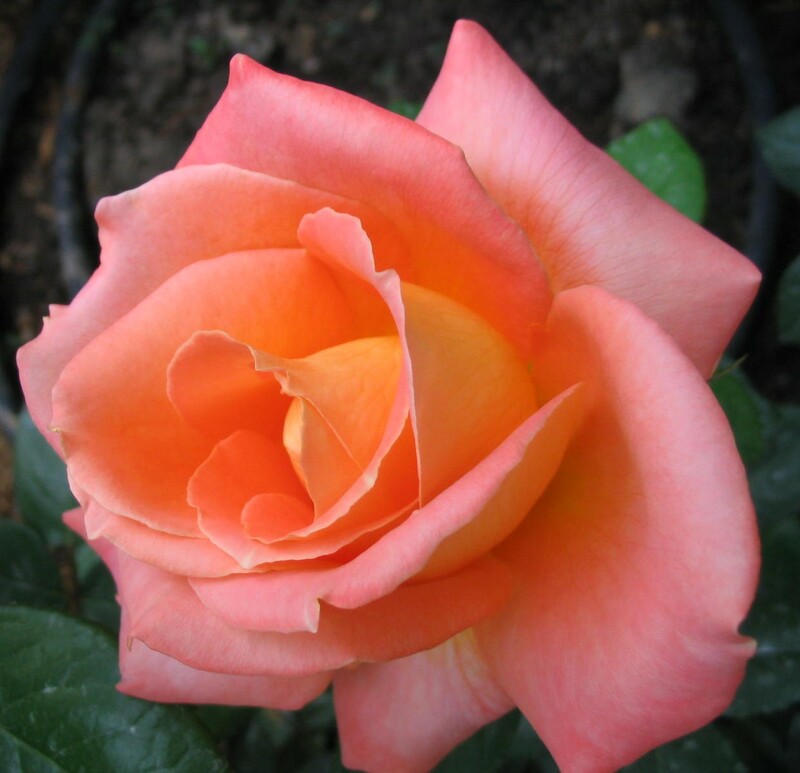 The annual plant sale is taking place Saturday, May 16. 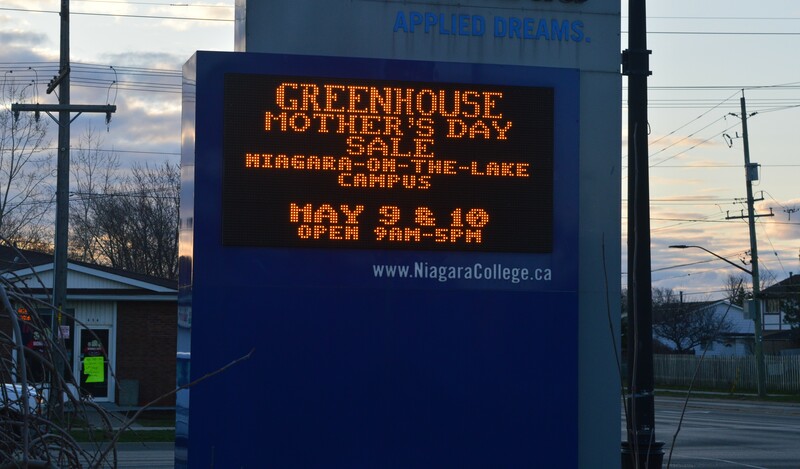 It is being held at the Niagara Regional Exhibition grounds. Doors open at 9 a.m. and the sale ends at noon. This is a great buying opportunity for local gardeners. Many different varieties of perennials will be available from members’ gardens and based on past experience – the price is right! Get some some good stuff for your flower beds and support Welland Horticultural Society at the same time. Mass at Holy Cross Cemetery. 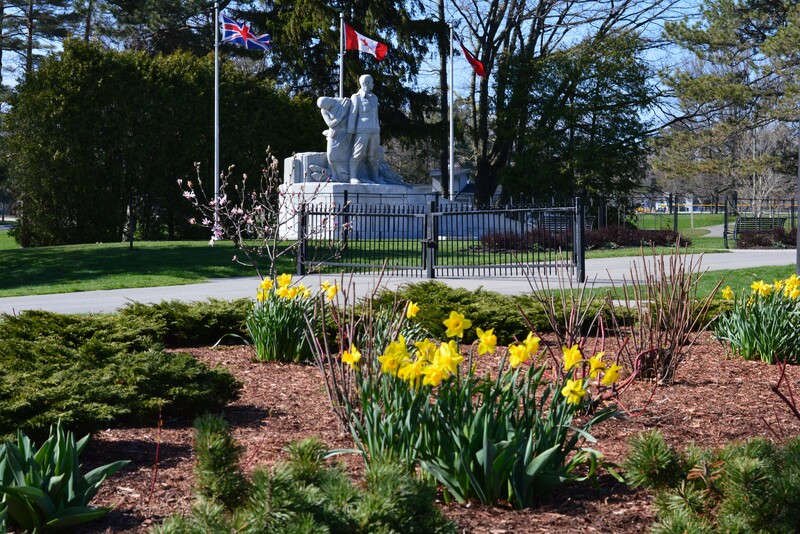 All are welcome to join with St. Catharines diocese Bishop Gerard Bergie as he celebrates the third annual Outdoor Mass at Holy Cross Cemetery, 50 Woodlawn Road, on Saturday, May 30 at 11 a.m.. In the event of inclement weather, the Mass will be rescheduled for Saturday, June 13. Welland’s amateur theatre group is soon to present its next production. Canalside Players will return to the stage with Last of the Red Hot Lovers, the big hit show written by Neil Simon. 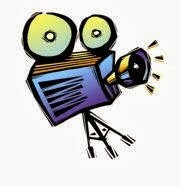 Director of the local production is Lee Moffatt. The dates are: Friday, May 1 and Saturday, May 2 and Friday, May 8 and Saturday, May 9 at 8 p.m. and a matinee Sunday, May 3 at 2 p.m. The play is presented with special arrangements with Samuel French, Inc.
Tickets are $13 for passholders and $15 for non-passholders. The Physician Recruitment Program of Niagara has launched a new search function on www.niagaradocs.ca where residents of Niagara can search for a family physician in their community, or a nearby one, if they do not have one. If a person cannot find a doctor accepting patients they will also be able to register themselves and their family members to a database. 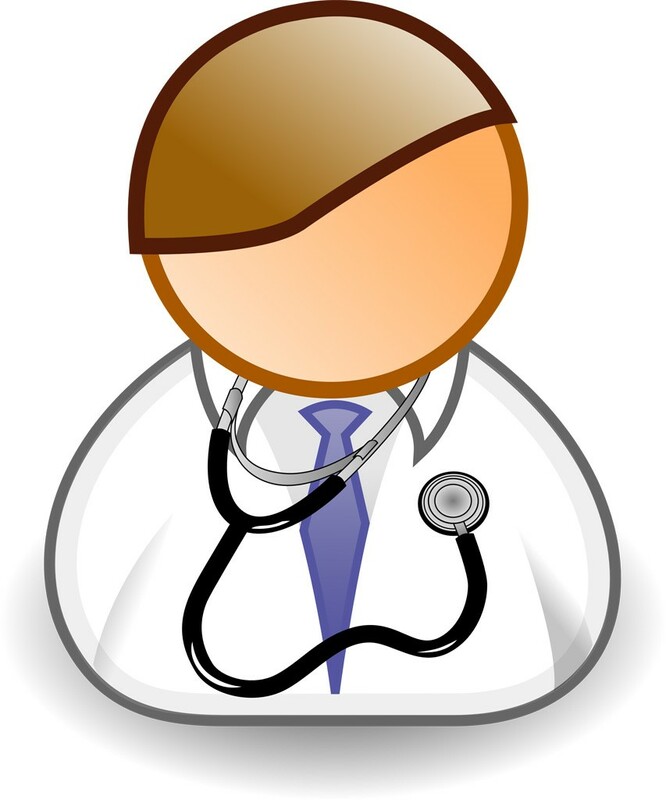 It is important to note that the decision to accept patients is solely at the discretion of the doctor. Catholic Education Week is being celebrated Sunday, May 3 to Friday, May 8. The theme this year is Catholic Education: Exploring Paths of Joy. The week provides an opportunity for inclusion of all the partners in the Catholic education triad – home, parish and school – to celebrate its publicly-funded Cathoic schools. The Region provides branch collection in the spring and fall to residents living in single family homes and apartments with six units or less. Branches must be tied into bundles, maximum weight of a bundle: 22.7 kg (50 lbs. 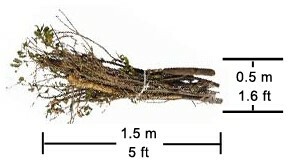 ); maximum size of a bundle: 1.5 m (5 ft.) in length, and 0.5 m (1.6 ft.) in diameter; individual branches inside of a bundle must not exceed 7 cm (2.8 in.) in diameter. Stumps, large branches / limbs and tree trunks are not collected at the curb. Drop these off at a landfill year-round for free. 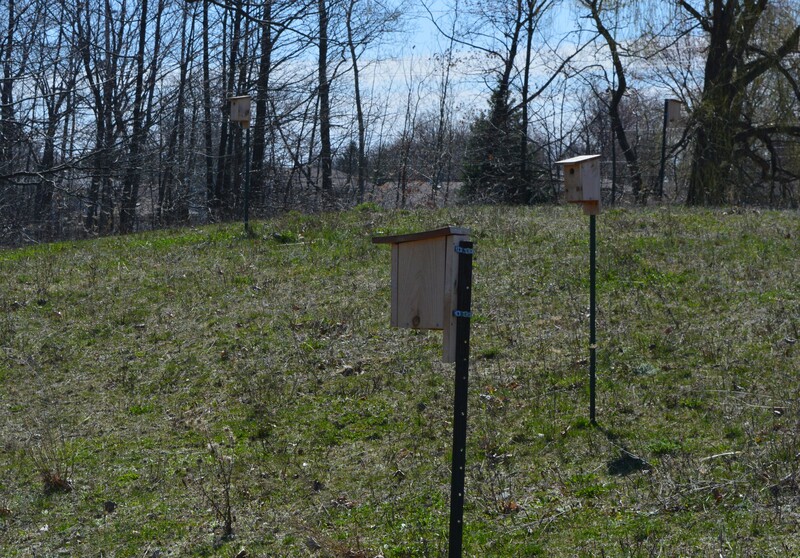 Stumps can also be brought to the Walker Environmental Group Landfill site in Thorold. Tipping fees may apply. Spring collection dates are: May 4-8; May 11-15; May 18-22; May 25-29. 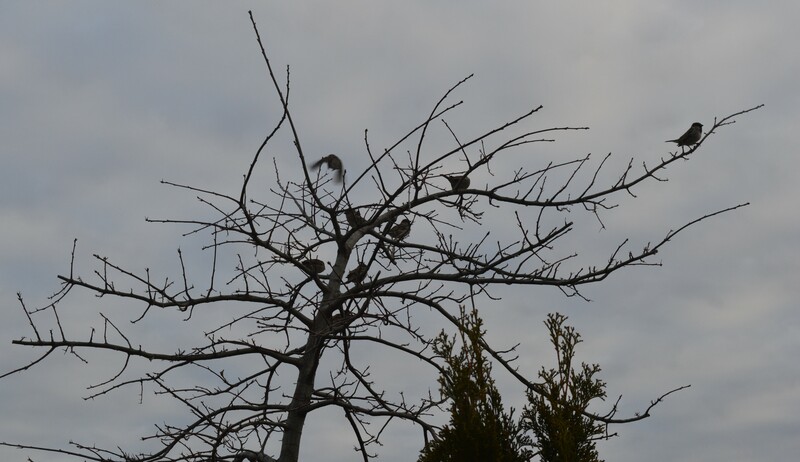 Branches may be dropped off at any landfill year-round, free of charge. A Taize prayer night is being held at St. Kevin’s, Niagara Street, Welland. Taize prayer at Pentecost is on Tuesday, May 26, starting at 7:30 p.m.
Taize prayer nights are held four times a year at the Welland parish. A popular choral group, the Velvetones, is holding its annual concert. It’s Saturday, May 23 starting at 1 p.m. at the Welland Community Wellness Complex, Lincoln Street. ‘Melodies of Spring’ is the theme of this year’s concert. According to an advertisement on the Civic Corner page, it will offer a selection of contemporary music including a medley from Les Miserables, and a celebration of the 50th anniversary of The Sound of Music. Tickets are $6 for passholders and $8 for non-passholders. Refreshments are included. Tickets are available at the Wellness Complex reception centre. This entry was posted in Uncategorized on April 28, 2015 by fromareportersnotebook. 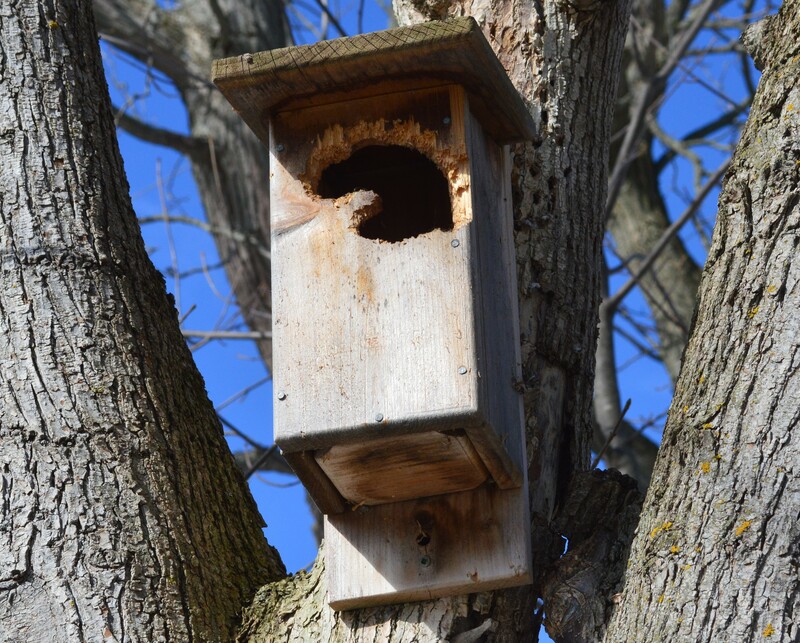 Steffie Wong, a volunteer at Niagara College’s Earth Day and Arbor Day celebration on Saturday, shows part of a bee hotel, bee condo or bee house as they are variably known. They were featured in a display for community visitors. 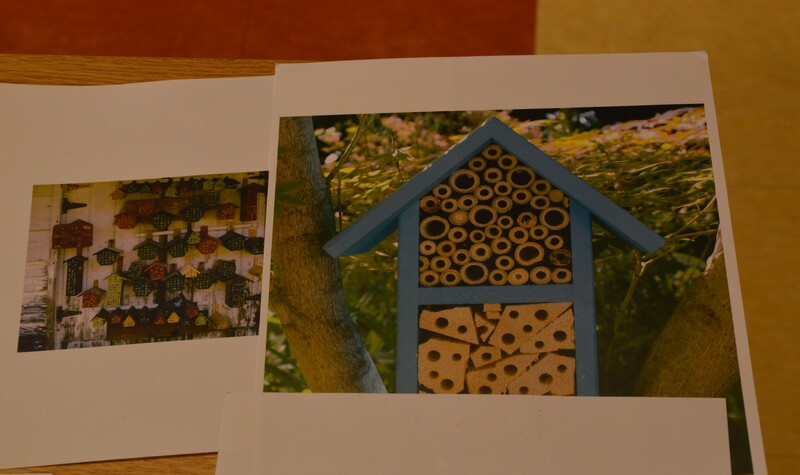 According to one online source, bee hotels are places for solitary bees to make their nests. These bees live alone, not in hives. They do not make honey. Solitary bees are much less likely to sting than honeybees because they aren’t defending a hive. Solitary bees lay their eggs in small holes. You can tell bees are using your hotel when they make a mud “door” to cover the entrance hole. This means a female bee has laid an egg inside. After the bee hatches, it will eat a supply of pollen until it is ready to break through the mud and fly away. This entry was posted in Uncategorized on April 27, 2015 by fromareportersnotebook. 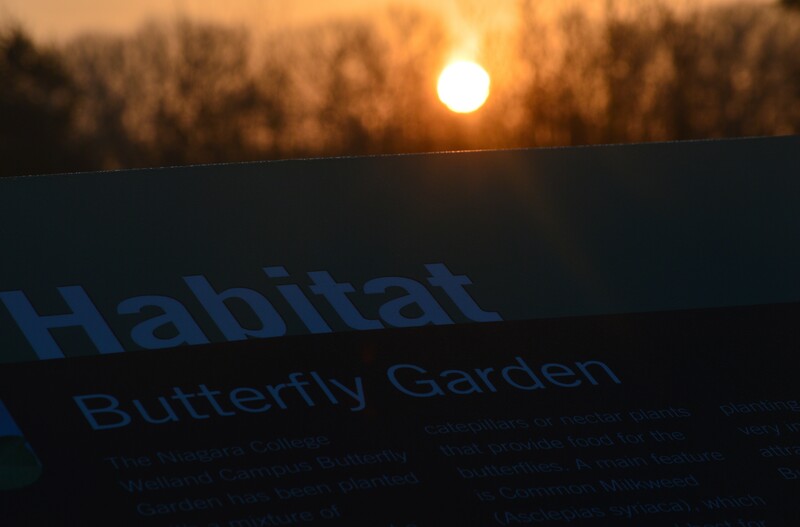 Niagara College continues along a path that simultaneously contributes to and exemplifies faith in Welland’s future. Just some of the trees planted Saturday. It bucks the trend and sad history of closures, shutdowns, downsizing and moves to other places that have characterized Welland’s recent history. Instead of exodus, the college provides leadership in terms of impetus, it is a driving force for helping Welland grow. It invested milliions and millions of dollars in expansion of the Welland campus a few years ago, coming to fruition in 2011 with the official opening of the Applied Health Institute, Technology Skills Centre, classrooms, labs, athletic centre, learning commons and student centre at the Welland centre. Other projects and initiatives have taken place since that milestone achievement. 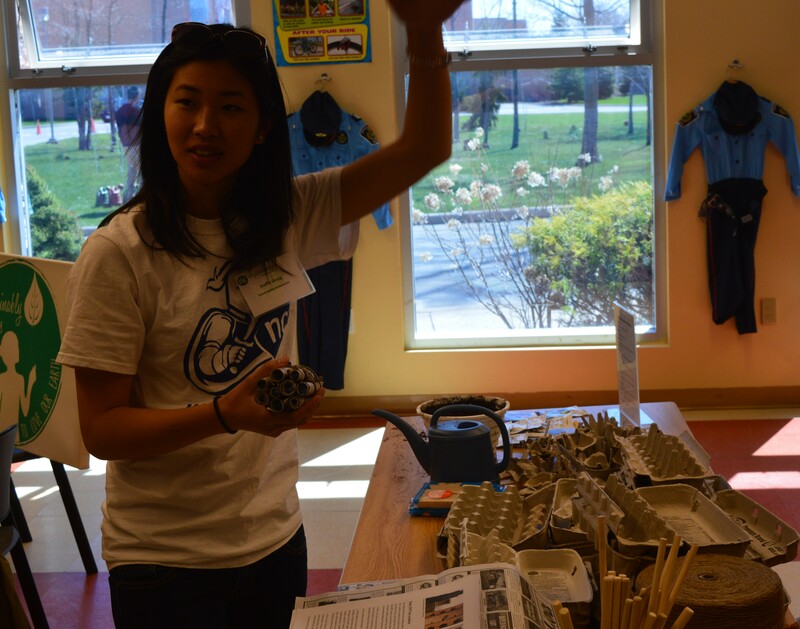 Just this past weekend, the college held an Earth Day and Arbor Day celebration, for example. On the surface, no big deal compared to the infrastructure growth at the Welland campus since 2008, one is tempted to say. But there is great and long-lasting significance to this.Tree planting and a groundbreaking ceremony for the “edible orchard” were components of the activities. Trees Canada had a representative on site for the event – it funded the bioversity project that is making possible the planting of fruit trees on a site near the existing community garden and Children’s Safety Village.Trees Canada has been around for 23 years and in that time 80 million trees have been planted through initiatives it has shepherded, spokesman Ed Borczon said. 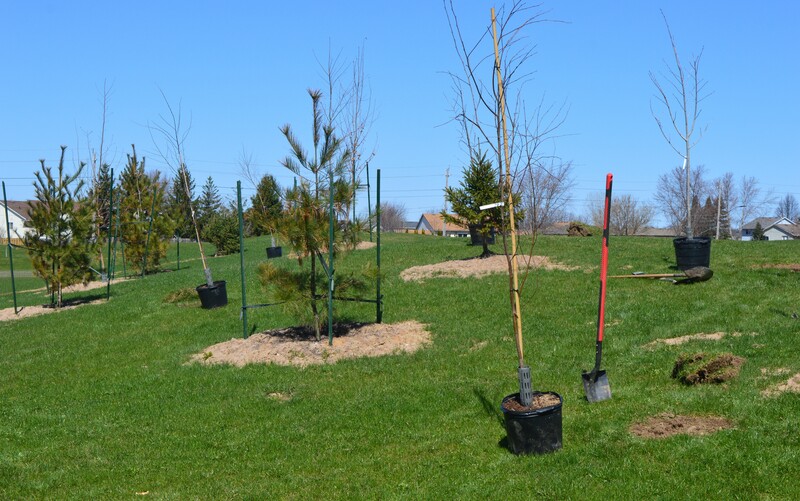 Another nice touch was that of allowing local residents opportunity to participate in the planting of spruce, tamarack and several other varieties of trees that went into the ground Saturday morning. 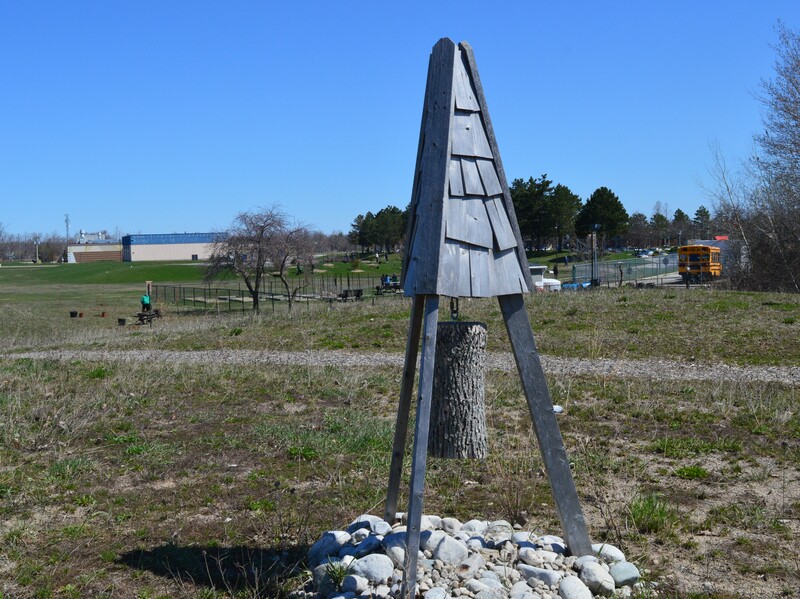 The fruit trees, to be planted in two phases this year and next, will provide food for local food banks and will be used as a “living laboratory” for college, elementary and secondary school students. Hear, hear! Other activities offered at the Welland campus on Saturday included tours, workshops and displays. 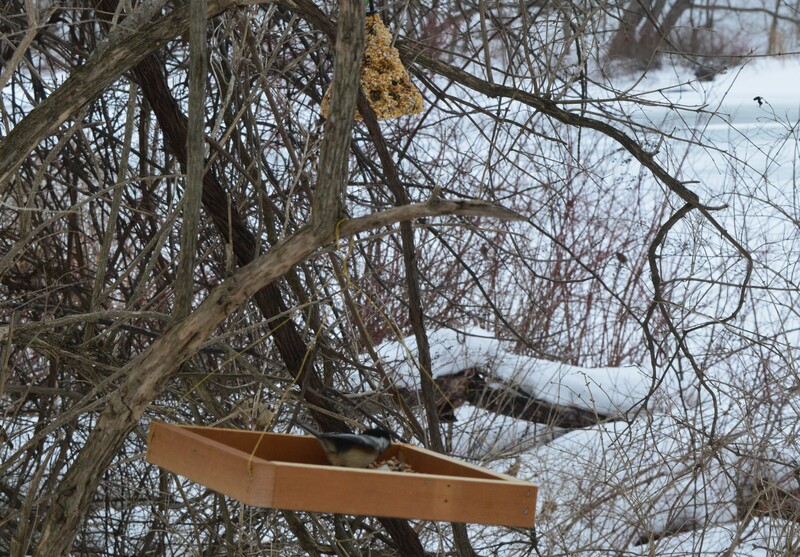 Guests could learn how to build a seed feeder, start a bean garden and build a bee box, as three examples. All point to how the college reaches out to the community and what it does to sustain its presence as a vital, pro-active presence. Niagara College personifies growth here in Welland and is a beacon of faith in its future. We could use more like it. This entry was posted in Uncategorized on April 26, 2015 by fromareportersnotebook. Adorable love nest in west-side Welland neighbourhood, amazing backyard with gardens, fish pond. Within walking distance of pristine park. New on market, a 2014 Christmas gift. Owner occupied but available on short notice. Beautifully treed grounds in college neighbourhood. 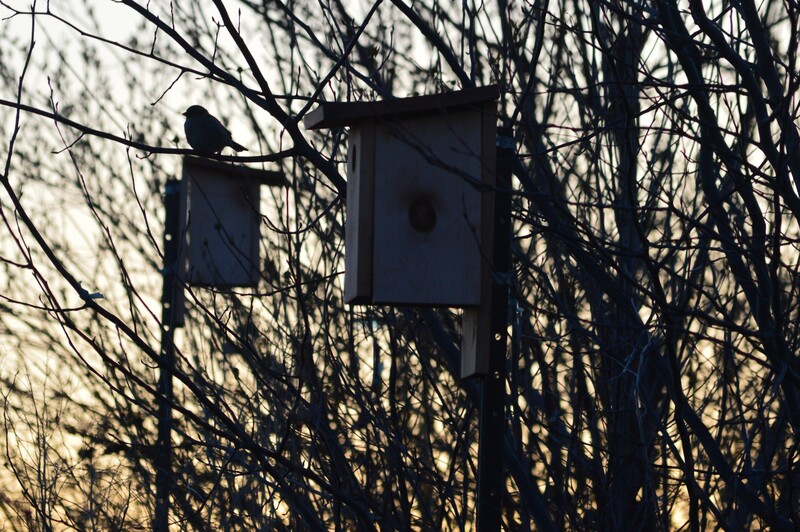 Bonus: rise each morning to a chorus of song by winged neighbours, priceless! Relatively new neighbourhood in north Welland, well maintained, close to college campus, Y, Safety Village. 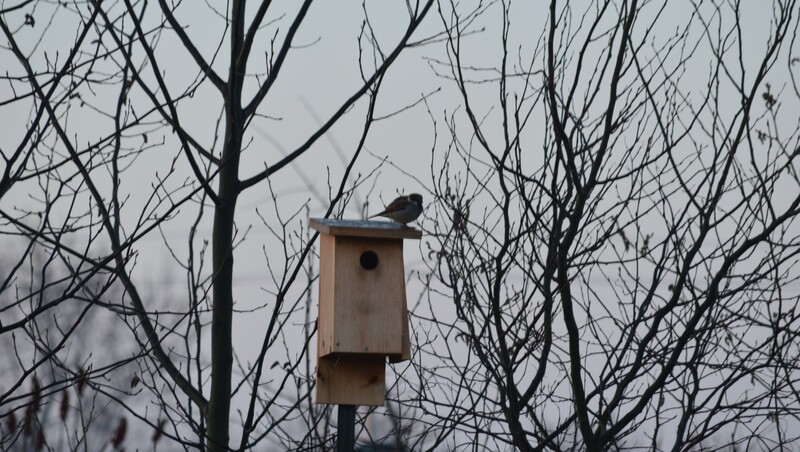 Move-in condition, come on your own or with others in the flock for a real family feel! Make an offer! Cute, affordable raised bungalow in prime college-area development. Move right in and make friends with neighbouring empty-nester who would like to have you for company! Location, location, location. Popular island between river, canal makes this so desirable. 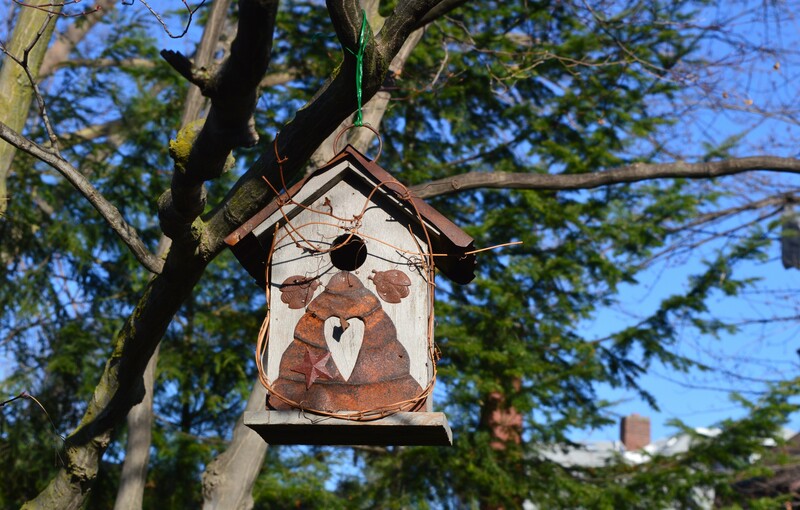 A fixer-upper but it’s sure to fly away fast so go ahead and make an offer! This entry was posted in Uncategorized on April 25, 2015 by fromareportersnotebook.